OAI Airlines, complete with filthy armrests & clearly designed in the 70's. 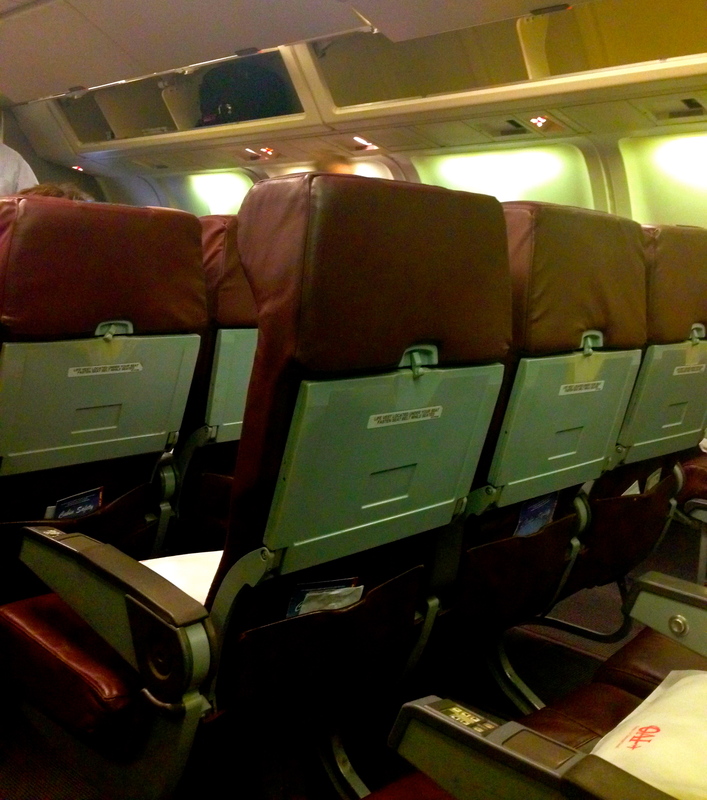 OAI Airlines, complete with filthy armrests & clearly designed in the 70’s. I was recently voluntarily delayed a day in Boston while traveling to Dublin, after boarding a horrific-looking aircraft and refusing to fly across the Atlantic in it. What was supposed to be an Aer Lingus flight was instead a rented plane from OAI airlines, staffed with completely unprofessional attendants who were joking about the appearance and age of the plane. Not only was the plane completely dated and in need of a major overhaul, the buttons on the arm rests were corroding, what was left of the carpet which lined the flooring was worn almost to non-existent and the overall ambiance was drab and questionable. My main complaint, however, resonates in the attendants, as NO one should feel unsafe onboard an aircraft; loudly commenting to other passengers about how poorly designed the plane is, finding humor in stating “sadly, you’re actually sitting in first-class” and laughing uncontrollably about their words isn’t the flight experience I nor the entire cabin of passengers paid for. Those few minutes during boarding was when I decided I wasn’t flying overseas with a staff of incompetent attendants who find laughter in making me uncomfortable. When it comes down to the price of a ticket these days, should passengers compromise their comfort and checkbook balance in order to arrive to their desired destination? Once I pulled an attendant aside and informed him I didn’t want to fly with this particular airline, I was escorted off the aircraft by security and an Aer Lingus staff member walked me to the ticket counter to reschedule my flight. This employee saw the inside of the aircraft, and she too agreed with my reasonings for wanting off the flight. I was told that usually I would have to pay a change of ticket fee, however, due to the fact the airline change was the fault of Aer Lingus, my change fee was waived and I was booked on a flight for the following day. The fact that my fee was waived was great, but now I was stuck in Boston at 11pm and in need of accommodation. In need of a place to stay, and not knowing the area, I chose a hotel near the airport that offered a shuttle and was checked-in around midnight for the whopping price of $240. A fee I had not intended to spend, a delay I had not planned on experiencing and infuriated about missing out on a day I had planned in Dublin for the TBEX travel blogger convention, I angrily forced myself to bed. Yes, I want to get where I’m going safely and comfortably, which is why I chose to fly with a known airline, not an airline that has only 9 planes in their fleet. This is also why I spent hundreds of dollars on my ticket; I want my international flight to be relaxing. During the last night of the TBEX convention, I had a conversation with a representative from Travelocity that had actually been on the OAI flight I demanded to exit from. It wasn’t until I had talked with him about the flight that I realized how happy I was to switch my ticket. Not only did he also agree how awful the interior of the plane was, he commented on the staff and overall inflight experience. Aside from the plane looking as if it were purchased through an auction and salvaged, one issue he addressed really left me angry. After I left the aircraft, the pilot spoke on the microphone, saying “just to let you all know, this is a real plane and I’m a real pilot. I just flew to three destinations.” The Travelocity representative said the pilot’s speech was so incredibly odd, and that everyone seemed to be uneasy after hearing it. Again, NO one should ever feel uneasy about an inflight experience, and clearly the staff of this OAI flight just don’t understand the seriousness of making their passengers comfortable. There was a second Travelocity representative that had also attended the TBEX conference and was sitting in on our conversation, who added she had originally booked an Aer Lingus flight to Dublin as well, however her flight was substituted for a Titan aircraft. Her complaint was that she had upgraded for extra leg room with Aer Lingus yet didn’t receive it on the Titan flight, nor did she receive any kind of compensation for her booking. Sitting at one small table were three people, all with three separate bookings yet heading to the same place on the same airline, and each one of us felt Aer Lingus ripped us off along with the other passengers. Obviously issues occur that require the decision of canceling a flight or chartering another aircraft in efforts of avoiding having to reschedule passengers and compensating for accommodation. But does this mean at the cost of creating discomfort for passengers? Does this mean taking money from those who paid more for upgraded amenities or leg room? What about the issue (the main issue, in my opinion) of unprofessional attendants who mock the plane and a pilot who finds it necessary to address the passengers by stating there’s no need to worry and that they are truly flying a “real” plane and he is a “real” pilot? Granted Aer Lingus tried to get their passengers to their destination, and they did succeed in that task, however do they owe it to their paying customer the guarantee of being in the hands of a caring staff and equally accommodating airline? Perhaps I am asking too much, and others might state that it was my choice to be delayed a day on my arrival in Dublin. Maybe I shouldn’t be complaining, however customer service is a very important aspect of a company, and when all the passengers on a flight feel uncomfortable for their safety, are in shock on how the attendants are acting and are flying on a plane that does not match the price of their original ticket, I feel the airline responsible should take action in order to save an angry customer. What do you think? Have you had this happen, or what would you do if you had to question the plane and crew flying you to your international destination? Does Aer Lingus owe their passengers anything for this experience? 6 Comments on Do Airlines Owe Their Passengers Compensation for Bad Decisions? You absolutely should have that right! Can you imagine if an incident like this happened to Anthony Bourdain, or to somebody who wrote for Nat Geo Traveller, or something like that? It’d appear on TV or in the magazine — front-and-center — as soon as they could make it happen, and the company would be knocking over themselves to apologize, and somebody might even get fired! Thanks for circulating it, but really? Sorry again? They never apologized the first time, so what is this sorry again? I really hope others on the OAI flight send in some emails, because they shouldn’t be paying the cost of an Aer Lingus flight for THAT flight! I do feel the airline was in the wrong by not offering the customers the option of taking a later flight at no expense to them. Airfare has gotten ridiculous with all of the extra fees, for them not to be compensating their patrons. I too have changed flights, paid the expense of an overnight stay at a hotel with no compensation from the airlines. It is definately a topic that needs to be addressed more. Yes! It’s not right, and like you said, the fees are ridiculous. Better yet, INFORM us upon check-in about the change, offer us the option to change our ticket at no cost and be more courteous. When I checked-in, the only thing I was told was there was a delay due to technical difficulties, and we were waiting on another plane to land from Chicago. While this was true, it was misleading. A plane from another airline, disclosing which airline it was, would have been the thing to do, and then I would’ve switched my flight and had the entire day to spend in Boston. Plus, I would have walked away a much happier customer, likely to fly again. Definitely not the case now! Ouch! I would also have asked to leave the plane. That does *not* look comfortable, or safe. I do believe you are within your rights considering the state of the plane, I would even write a complaint letter to Aer Lingus asking for a compensation (reimbursing meals, a part of the hotel, or other). I have written a letter, just waiting for a response. This is not acceptable, especially for those that stayed onboard and had to question the pilot. I’m so happy I switched my flight!